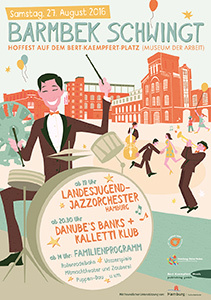 On 27 August the Museum der Arbeit together with its neighbours in the square and friends held the 8th Hoffest on Bert-Kaempfert-Platz. The latest summer festival, “Barmbek swings 2016”, provided a varied family programme in the afternoon. The evening saw a performance by the “Landesjugendjazzorchester Hamburg” and the big bands “Danube’s Banks” and “Kalletti Klub”. The LJJO HH offers Hamburg’s most talented jazz musicians the opportunity to be promoted in a musically homogeneous ensemble with social cohesion being particularly emphasised. This cohesion is achieved on the basis of project-based working phases on a variety of topics as well as creative and innovative ideas and concepts. In addition to work on content, consisting of teaching the essential musical and technical basics of big band jazz and stylistic variety, the LJJO HH also acts as a talent factory by offering special projects, concert tours and music-teaching programmes for German jazz in general and Hamburg jazz in particular. During a break in their performance the LJJO HH was presented with the certificate of the Bert Kaempfert Foundation`s “Sponsorship Prize 2015”.